Wearable Augmented Reality (AR) combines research in AR, mobile/ubiquitous computing, and human ergonomics in which a video or optical see-through head mounted display (HMD) facilitates multi-modal delivery of contextually relevant and computer generated visual and auditory data over a physical, real-world environment. Wearable AR has the capability of delivering on-demand assistance and training across a variety of domains. A primary challenge presented by such advanced HCI technologies is the development of scientifically-grounded methods for identifying appropriate information presentation, user input, and feedback modalities in order to optimize performance and mitigate cognitive overload. 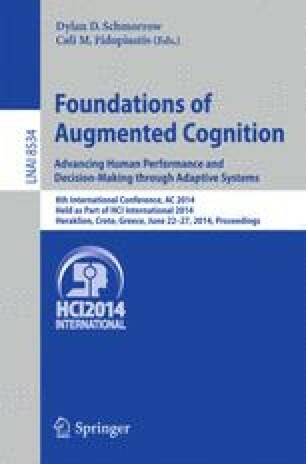 A proposed framework and research methodology are described to support instantiation of physiologically-driven, adaptive AR to assess and contextually adapt to an individual’s environmental and cognitive state in real time. Additionally a use case within the medical domain is presented, and future research is discussed.